sprays paint through aerograph pencil by compressed air to produce colour designs on Christmas cards, wallpapers, or any painted surface, with or without use of stencils. makes calendar by affixing, in correct order, printed sheets (each giving a day or a month) to card foundation, using gum, wire stitching machine, etc. cuts stereotype, electrotype, or process plates to required size on guillotine machine and finishes with bevelled edges on power bevelling machine or by means of hand plane. produces copies (white lines on blue ground) of engineer's drawings or architect's plans, by exposing tracing of drawing over sensitised paper (ferro-prussiate, etc.) in a printing frame to sunlight or arc light, developing and washing print in large flat dishes or sinks, and drying; may also work by phototype process, producing copies with black lines on white ground, see phototype printer. cuts strawboard or millboard with board-cutting machine or guillotine by placing board against gauges, and pulling lever or otherwise operating machine. attaches suitable printed slip to ornamental cover and ties together with ribbon, etc. removes old designs from lithographic plates or stones, by grinding or by use of chemicals; usually acts as lithographic plate or stone grinder q.v. paints over photographs in water colours or oils; sometimes previously prepares surface with a flat wash of some special medium. reads aloud from original manuscript or copy, while reader q.v. or corrector of the press q.v. checks printed proof. a reader q.v., proof reading for newspapers. counts and piles sheets in numbered groups before cutting or despatch. adjusts . paper on bed of cutting machine, bringing it into exact position under knife; clamps pile of paper with heavy iron clamps; and moves lever which releases heavy knife. places required number of book leaves, folio sheets, etc., on machine; adjusts cutter of machine; presses a foot lever which brings down cutter, and cuts sheets or leaves to shape and size required; passes cut material to numberer (549) q.v. a guillotine cutter q.v. or a shear cutter q.v. who trims edges of labels. cuts up printed sheets into playing cards by means of rotary cutting machine. cuts edges of showcards, strawboards, etc., with hand lever shears. cuts, by band or by machine, reels of wall paper into lengths of 12 yards, each piece being 22 inches wide. designs, draws and colours patterns for wall paper. arranges "lay out" for advertisements, etc. ; is often a specially skilled compositor (522) q.v. presses block covered with size on paper as in block printing, cf. block printer (535); passes paper, so printed, through drum or trough of linen filled with wool or silk flock, and beats underneath drum to make flock adhere to paper. receives printed sheets in condition in which they leave printer's hands and folds them by means of a small wooden or bone spatula, so that pages run in numerical order and are in register; folding for ordinary bookbinding is usually done by machine, cf. folding machine feeder (549). (ii) hand process, for small quantities, applies French chalk to paper, and rubs it with brushes or with a cloth, by hand. "grains," or slightly roughens, surface of lithographic plate or stone for production of half-tone work; uses a hand or machine driven muller and sand; or works all over surface of stone with a mechanically-driven revolving disc attached to flexible rod and usually hanging from ceiling. (ii) grinds zinc plates, usually by placing them with a number of porcelain marbles in a tray, which is shaken from side to side by machinery; usually acts also as lithographic plate or stone cleaner q.v. cuts paper mainly for pattern books, using ordinary paper guillotine. takes off trial impressions on cloth of finished engraved rollers on an impressioning (or small printing) machine with coloured pastes; puts colour paste into doctor or paste feed of machine, allows paste to run on to roller and removes superfluous paste by causing roller to revolve against doctor knife; places cloth by hand on bed plate and by means of lever control causes cloth to pass under revolving roller; removes cloth for examination when impression has been made. levels copper plate by hammering on lithographic stone. examines model map globes representing the earth, to ensure that the map sections are correctly pasted on. a map mounter q.v., who cuts maps into sections; mounts section on linen or other fabric, or on strong paper, to facilitate folding, and makes them up into book form. attaches printed sections of map to globe to form demonstration model of the earth, etc. works at a trough filled with size; mixes colours and throws them into trough, where they remain on surface of size; draws comb-like instrument over the colours to make design required; dips edges of book into mixture; washes off surplus size from edges and allows book to dry. paints paper by hand to imitate surface of marble. mounts maps, showing cards, etc., on mounts by placing very thin sheet of gelatine between map, etc., and mount, and then applying heat by rubbing with a heated iron or by placing in a heated press. glues or pastes printed map on to linen or cardboard. fixes printed sheets on stiff mounts with adhesive liquid or in a press by application of heat, see mounter, dry. affixes stereo, electro or process plates to blocks of wood or metal with nails or spring catches, taking care to make plate and mount together standard type high; sometimes also cuts metal to required size with circular saw; routs out portions of plate to be left white in finished block, with routing machine, i.e.. revolving cutter on a power-driven spindle, and bevels edges of plate with rotary beveller; sometimes specifically designated,- e.g., process mounter, half-tone process mounter. a mounter (stereotyping, electrotyping and process engraving) q.v. who mounts plates, prepared by three-colour process. general term for any printer's craftsman engaged upon newspaper work, including compositor (523), printing machine minder (529), machine assistant (530) q.v. ; term is used mainly to differentiate workers engaged on newspaper work from those on ordinary letterpress printing, where both kinds of printing are carried on. reduces thickness of metal plates by means of nittling or planing machine. places sheets of paper pulp in large hydraulic presses in manufacture of very thick mural coverings in solid relief e.g., lincrusta, anaglyptic and similar decorations; removes them after being pressed, and generally looks after presses, fixing moulds, etc. 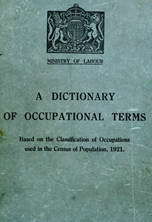 general term for workers engaged in colouring paper by hand or machine. squeezes a carbon print from a reversed positive on to a copper plate or cylinder, and immerses it in hot water, thereby dissolving away gelatine unaffected by light; cf. carbon printer (527). reproduces, by phototype process on ferrotype printing paper, tracings of engineer's drawings or architectural plans; places tracing over sensitised paper in printing frame and exposes to arc light; removes paper, develops and washes in porcelain dishes or sinks, and finally dries it in drying chamber or in heated press. inserts corrections in type on metal stereotype plates, and repairs broken letters, with pointed tool. fixes diary or writing paper sheets in cases or covers and finishes process of binding. smooths lithographic stone after it has been ground, by moistening it and rubbing another stone upon it. polishes sheets of tin, after printing, with pumice powder, by hand, or machine. paints post-cards by hand, or colours drawings or photographs. feeds cards into machine which applies coating of varnish or gelatine; or may apply glaze by hand brush or squeegee. cuts up printed cardboard sheets into postcards by means of rotary cutting machine. or may be a lithographic writer (528) q.v. engaged on poster work. general term covering lithographic plate or stone grinder, polisher, grainer or cleaner q.v. pulls or prints in a hand press from lithographic stones or plates preliminary proofs as work advances; cf. transfer printer (528) and printer's pressman. inks by hand with roller, a forme, stone, stereo, electro, or process block, and, by means of hand press, obtains proof from block, forme, stone, etc. (ii) puts light and shade in drawings of machines, and otherwise retouches them, with brush or aerograph pencil, to make them suitable for reproduction. examines lithographic proofs before printing. takes work from lithographic machine to racks for drying. reads proof pulled from type and corrects all errors in composition, grammar, punctuation, etc. ; is usually assisted by copyholder q.v. see corrector of the press. a reader q.v. who finally revises printed sheet before machine is set in motion. manipulates hot rolling machine, which, by means of hot rollers, dries, presses, and calenders sheets received direct from printing machine. inks stone by passing a roller, covered with lithographic ink, over it. routs or gouges out portions of stereo, electro, or process plates by revolving cutter on a power-driven spindle; cf. mounter. arranges colour transfers before transferring them to stone. draws out a design or lay-out for a show card, either roughly in pencil to be worked up by show card writer or in more detail with ink and colours for actual use or for reproduction by lithographic or other printing process. cuts out show cards from cardboard, by hand or with a guillotine or rotary cutting machine; mounts printed matter on card, see show card mounter. a mounter q.v. fixing printed sheets on to slum cards. paints prices and descriptions of goods, by hand, on show cards for window or shop display. coats ticket, by spraying with a ground of white or other paint and stoves to harden-on paint; places stencil over groundwork; sprays coloured paint over it and stoves again; finally applies coat of varnish, by spraying, and again stoves. prepares lithographic stones for map printing, i.e., works on stone with chalk to produce variation in tint as required, e.g., deeper tint round boundaries of specified areas, countries, etc. treats film of several negative plates with rubber solution, and then strips films from glass with methylated spirit; places these films face downwards on one large sheet of glass, so effecting subsequent economy in photo process; sometimes done by metal printer (526) q.v. (ii) prints or writes, on small strips of cardboard, previously cut in a cutting machine, prices and descriptions of goods, for window display; may also write show cards, see show card writer. varnishes tickets with a brush by hand and sets aside to dry, or more usually feeds them into varnishing machine, which applies a coat of varnish and then carries them through drying chambers. as for show card writer, but work usually of simpler character. writes on tin tickets by applying coloured paint with a brush; ticket is afterwards stoved to harden-on paint. a phototype printer q.v. who prints from engineer's or architect's tracing on to specially sensitised paper by means of exposure to arc light and transfers imprint to gelatine surface on a slab; takes copies from the gelatine, by laying a sheet of paper on gelatine and pressing the two into even contact. (ii) varnishing machine minder; machine process, instructs labourers as to filling varnish duct, or trough, in machine; regulates -power which drives machine; passes cards or paper into machine; watches varnishing process to detect flaws; piles up varnished cards as they come from drying end of machine, or, if reels of paper are being varnished, watches re-reeling machine for breaks, creasing, etc. see varnisher (lithographer's, paper staining). a ticket maker q.v. who cuts out window tickets. as for show card writer.